Under the Health and Social Care Act 2008, all primary care practices in England must register with the Care Quality Commission (CQC) and are subject to regular inspection to ensure the practice meets the legal requirements under this act. The requirements under this Act (and the inspections that enforce those requirements) stipulate that all practices must meet a number of fundamental standards of care, one of those key standards is that premises and equipment must be clean and suitable to meet the needs of those that use the service. Being just clean is not sufficient, those that use primary care practices are often be more susceptible to catch or spread an infection, therefore it is vitally important that cleaning and infection control together are placed front and centre in the routine housekeeping operations. Imagine a long term employee quits or is taken sick, all that experience and knowledge is suddenly no longer reliable. Relying on key individuals in an organisation is a recipe for trouble in the future. The best way to prevent this from happening is to detail in writing all the procedures and processes that are required and codify it as an official document. 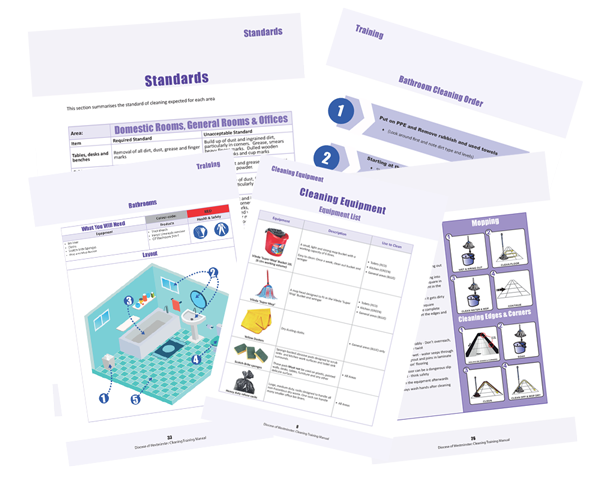 An operations manual that establishes in writing the official policy and procedures for all housekeeping operations is the backbone of your operations. It is designed to guide someone new or unfamiliar with your organisation through the routine procedures that they are expected to complete. A written operations manual saves you from relying too much on individual employees, it also serves to guide new employees and reinforce the training of existing employees.